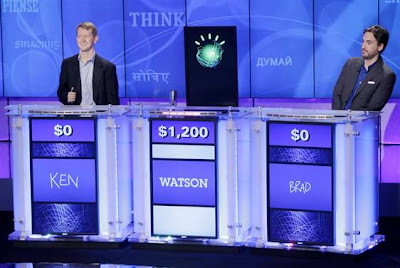 Those of you who have been watching Jeopardy know about the IBM Watson computer competing against Ken Jennings and Brad Rutter. While I think the technology is impressive. I believe Watson's buzzing ability has to be much quicker than an average human's. Ken and Brad know 90% of the answers to the questions, Watson is just beating them to the punch with a quicker buzz. You can see it in their reactions during the show. They know the answer but just can't ring in quickly enough. A fairer test of true trivia ability would be to have a list of 50 independent questions fed to each contestant individually in a sequestered environment. Each question would have a 5-10 second time limit associated with it. This way, all of the contestants have equal opportunity to provide an answer and you eliminate the artificial advantage that Watson has over buzzing in quickly. With the problems Watson has with some of the question wording I think Ken and Brad would beat the computer if the buzzing element is eliminated. As it stands right now, I don't think what we're seeing on Jeopardy is a true test of a fair trivia battle between man and machine. It's still entertaining though, especially when Alex scolds Watson.